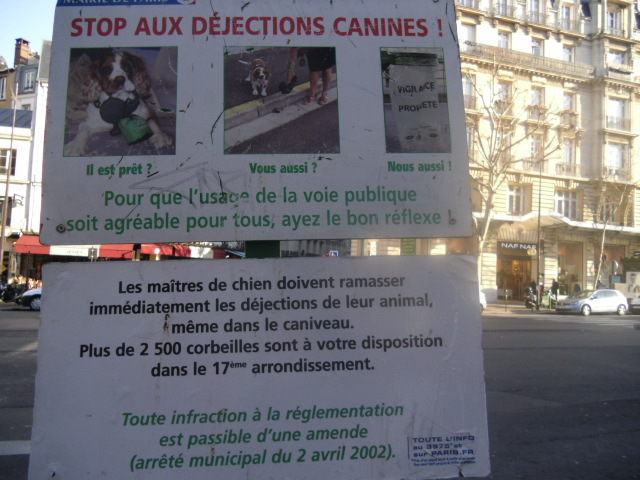 Most people don’t know this – it’s a secret well-guarded from tourists – that Paris streets are paved not only in cobblestone, but in…dog mess. The city keeps the touristy streets clean with dog-mess-picker-uppers, but in the other arrondissements, it’s a crap shoot. Literally. In London, you mind the gap. In Paris, you mind the crap. Is he ready? You, too? We are, too! So that the use of public roads can be nice for everyone, have good reflexes! Dog masters must immediately pick up their animal’s mess, even in the gutter. More than 2,500 garbage cans are at your disposal in the 17th district. All regulation infractions are subject to a fine. Yes, Parisians do bring their dogs to restaurants! I am currently dogless. 😦 Too hard to cart around while traveling…but one day. I bet the dog that left his comment next to the sign was smoking a cigarette while he did it. My, El Guapo – you seem strangely familiar with French-dog mannerisms! I spent a night in Paris on a lark some years ago. A bird crapped on me. I am not kindly inclined to the French. There are no NY pigeons. We have rats with wings. It’s true. I did love the city for the night I was there. It was Halloween, I was there on my own for one night, and it was a blast. Babble away, then, surfer babbler.